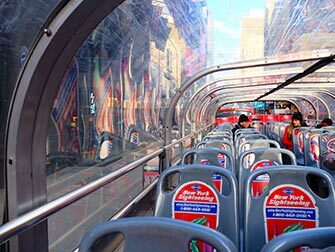 The red Gray Line Hop on Hop off buses in New York are probably the most popular sightseeing buses. Taking one or several tours is a perfect way to explore the city and its attractions during the first days of your trip. There are more than 40 stops where you can hop on or hop off the bus. 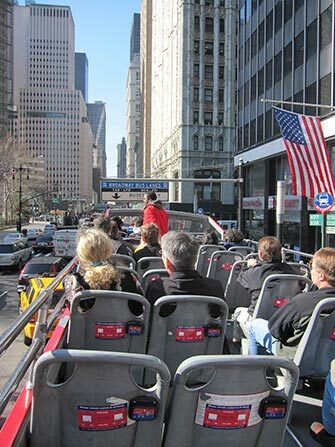 During the ride, your tour guide will tell you all about New York’s famous attractions. 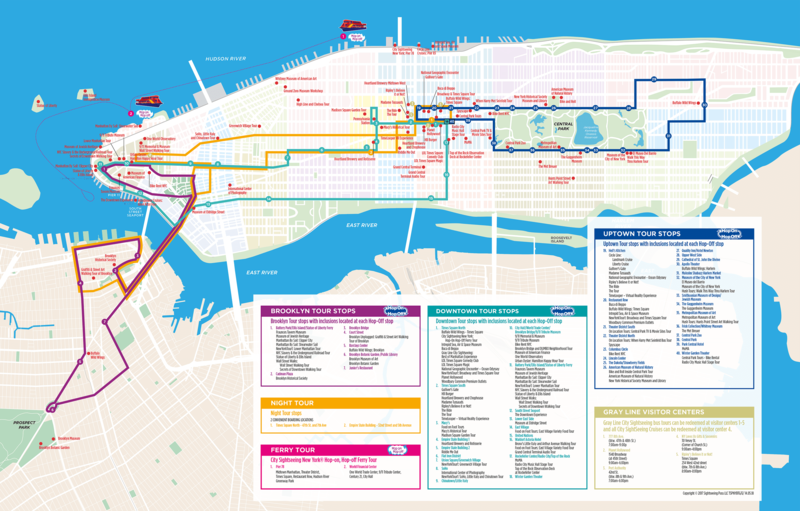 The Uptown and Downtown loops go through Manhattan. The buses drive along all main attractions. 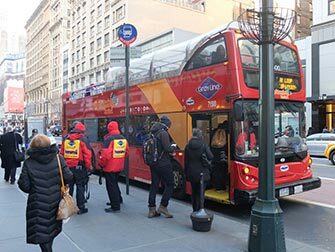 The Downtown loop starts on Times Square and includes stops at the Empire State Building, SoHo, Little Italy, Chinatown and Battery Park. If you buy a 24-hour ticket, you can make use of this loop for 24 consecutive hours. With a 48- or 72-hour ticket, you can also make use of the other loops such as the Uptown loop. This loop also starts on Times Square and goes all around Central Park. If you stay on the bus, the entire tour takes about 2 hours. You can of course choose to hop off at the American Museum of Natural History, the Upper West Side, the Apollo Theater in Harlem, the Guggenheim Museum or one of the many other stops. The Brooklyn loop is an extensive tour of Brooklyn which includes 8 stops. This loop departs three times a day, from Old Fulton Street by Prospect Street in Brooklyn. To get to this stop, you can take subway lines A or C to High St or F to York St. The bus drives through Brooklyn, where you see Barclays Center, Brooklyn Botanic Garden and the Brooklyn Museum for instance. If you purchased Hop on Hop off tickets for a minimum of 48 hours, you should definitely take the night tour. This actually isn’t a real Hop on Hop off bus tour as you can’t get on or off the bus at different stops. But don’t worry about that, I’m sure you’ll want to stay on the bus to experience the entire tour! During the night tour, the bus drives through Manhattan and crosses the Manhattan Bridge to head to Brooklyn. Taking this night tour will allow you to enjoy the most beautifully lit parts of New York. During the holiday season, you can take the Holiday Lights Tour instead. If you go on this tour, you will discover New York’s magical Christmas displays, decorations and lights. The Gray Line Hop on Hop off bus provider offers a variety of tickets and packages. You can buy tickets for one or multiple days. The cheapest option is the 24-hour ticket, which only allows you to take one route (Downtown, Uptown or Brooklyn). Are you only spending one day in New York? Then the 1 day ticket for the Big Bus is a good option for you. With this ticket, you can take the Uptown and the Downtown loop. The 48- and 72-hour tickets are more extensive options. Not only will these tickets allow you to make unlimited use of all different loops during the day, it also includes one night tour. With these tickets, you can explore the entire city within a couple of days! Besides day tickets, there are also several special package deals that include Hop on Hop off bus tickets. 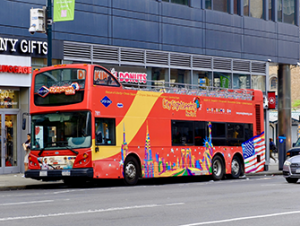 The best option is the Hop On Hop Off and Attractions Discount Package (also called Freestyle Package) which includes a 72-hour bus ticket as well as tickets for 3, 5 or 7 attractions. With this package you can also visit One World Observatory, which is excluded from every other discount pass. You can redeem your paper or mobile voucher for this package at the Gray Line Visitor Center near Times Square. 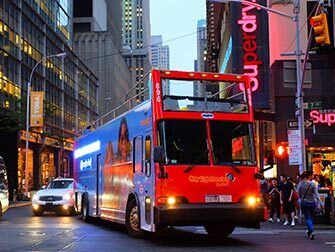 If you don’t want to make use of the Hop on Hop off buses during the day, but would like to take the night tour to discover the beautifully lit city, then you can book separate tickets.The night tour takes approximately 2.5 hours. During the holiday season, from the end of November throughout December, you can take the Holiday Lights Tour instead to marvel at the magical Christmas decorations in Manhattan.